Tokunation › Kamen Rider › Kamen Rider Ghost- Iguana Ghostriker, Kamen Rider Specter, Logo & Eyecon Images! 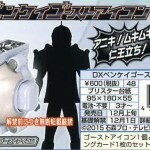 Kamen Rider Ghost- Iguana Ghostriker, Kamen Rider Specter, Logo & Eyecon Images! More news for the 17th Heisei Kamen Rider series is rolling in and now we have concrete pictures and info! 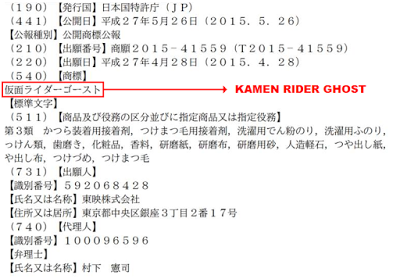 The following images give us our first clear look at Kamen Rider Ghost’s series logo. One which looks to incorporate further the overall Eye gimmick of the Ghost Eyecons. Additionally we have some first looks at Ghost’s toyline. 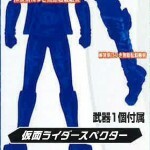 Up first is a silhouetted image of the secondary rider for the series, Kamen Rider Specter! 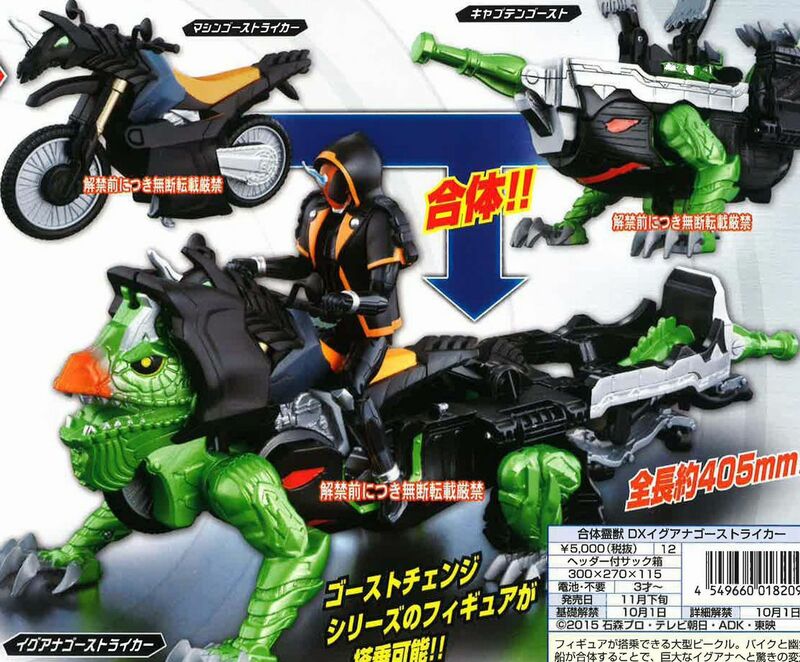 This image also confirms the name of this series gimmick line (ala Arms Change or Tire Koukan). Ghost’s line is known as Ghost Change! Specter is labelled as GC03 which is telling. Kamen Rider Ghost Ore Soul and at least one of his alternate forms will be released first with Specter up after that! 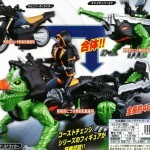 Which speaking of we also get a look at GC01 Ghost Orel Soul while riding his VERY unorthodox Rider Machine. That’s right, a multi-piece combining machine, this year we have the Iguana Ghostriker! The combination of a black and very skeletal horse-like bike and a literal ghost ship! When the 2 combine together it’s clear where this machine get’s it’s name, as combined they form a giant robot Iguana! These images also offer a clear look at the very first DX Ghost Icon! 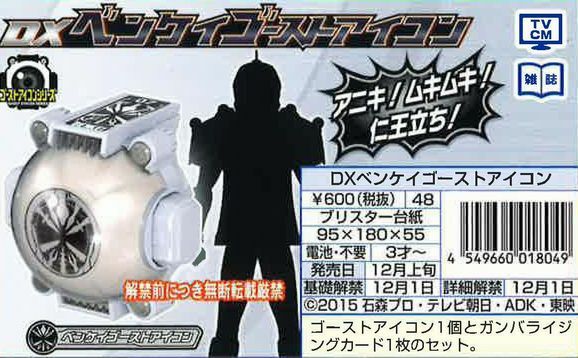 The DX Ore Eyecon is Ghost’s default Eyecon that allows him to access his standard Ore Soul form. In an earlier post by Jefusion(who we debunked earlier) the sourced quotes were from members of 2chan, this included FIqyFr3nB, who had previously provided rumors for Kamen Rider Drive's Type DeadHeat, Type Formula, and Kamen Rider Chaser. Still best to take with a grain of salt, but a fashion themed Rider would be interesting. We have our trademark! And unless there's some clever naming scheme, this seems to debunk the fashion rumors. Fashion themed? I heard it was going to be a card theme. But then, none of this is most likely true. I'm not even sure how a fashion themed series would even work. But then, I'll take anything after Drive. God I wish that show as ending already. I wouldn't believe Jefusion if I were you. Just wait till we see the trademark filed. Some of you need to learn not to believe JeFusion rumors! Like I said, I'm taking this with a grain of salt, but one of their sources did provide previous info that turned out to be true, so it's still worth taking into consideration. There's a way I can take this theme and twist it into a pony related pun. But I'm not really feeling it. So fashion pone. I know you like using ponies for reaction stuff now but man cut down the size of it, not everyone is a fan and this is primarily a toku forum. Keeping on topic. Fashion themed is quite an interesting one, it's not something usually marketed towards boys. I feel like it's going to be the same as the dancing in Gaim in that it'll serve as a backdrop as opposed to the theme of the suit and belt. But in saying that it might also be a theme in that parts of the suit will change as if changing clothes, a bit like OOO in a way. For example maybe different shoes could result in different Rider Kicks. Fashion sounds like a really good idea for the gimmick line as well. The Tire Koukan series is cool but it just doesn't stack up to, say, outfitting figures with an entirely new set of armor or swapping torsos and heads and all of that other stuff. You think fashion is a good idea for Kamen Rider Gimmick?! No boy want to watch or buy Kamen Rider Victoria's Secret Model! There exists fashion for boys too, you know lol. It's just another word for popular clothing style. You sir need to calm down.